My Big Fat Greek Diet: How a 467-Pound Physician Hit His Ideal Weight and How You Can Too! is written by Dr. Nick Yphantides, a Greek doctor who successfully lost weight by making some major lifestyle changes. After overcoming testicular cancer Yphantides was morbidly obese and decided to take a year off his job as a medical doctor to concentrate on getting healthy and losing weight. He wrote his Greek Diet with the goal of giving readers the practical tools they need to design their own successful weight loss plan. Yphantides decided to undertake an aggressive weight loss plan where for eight months he would survive on protein shakes and calorie free drinks alone while traveling across the United States to visit every Major League baseball park. As a huge baseball fan he regarded this journey as the pilgrimage of a lifetime as well as the only way he could manage going months without eating solid food. However, he does not recommend such an extreme strategy for his readers and instead outlines 7 Pillars Of Weight Loss And Maintenance. These include principles that dieters can use to create a personal weight loss strategy to suit their own lifestyle. Change the way you see before you change the way you look. Slash your calories by eating for the right reasons. Fill your tank with the right amount of the right foods. Burn calories like never before. Realize that your weight loss journey is for a lifetime. For each of the principles My Big Fat Greek Diet goes into details about how to apply them to help dieters to lose weight and keep it off. He says, “Food is for nutrition. I eat for very different reasons than I did in the past. How I eat and why I eat is more important than what I eat. There’s no one-size-fits-all solution”. Fruit, vegetables, nuts, lean meat, fish, whole grains, legumes, olive oil. Yphantides did not do much exercise during the time that he lost weight. However now he spends about an hour and a half engaged in cardio and muscle toning activities and says that it helps him to maintain his weight loss as well as giving a greater margin in regards to calorie intake. While he acknowledges that most dieters are unable to devote that much time to exercise he emphasizes that exercise is an important part of a weight loss plan and encourages dieters to start slowly if necessary. 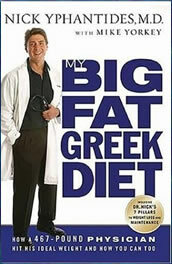 My Big Fat Greek Diet: How a 467-Pound Physician Hit His Ideal Weight and How You Can Too retails at $14.99. Encourages a permanent lifestyle change. Includes practical tips and advice. Does not advocate an extreme approach to dieting. Advises dieters to consider weight loss surgery only as a last resort. The dietary advice given by the author is not the same as the method he used to lose weight. Includes only general recommendations rather than a detailed weight loss plan. May take some time for weight loss to occur. Although My Big Fat Greek Diet is more of a motivational story rather than a diet plan. Yphantides offers dieters practical strategies that will support a weight loss and healthy lifestyle. Dieters should keep in mind that the diet suggestions in the book are not those that he used to achieve his significant and rapid weight loss. Results may take longer to occur by making gradual lifestyle changes however weight loss is more likely to be maintained by following this approach.